Village Walk remains one of Palmer Ranch's premier gated communities. One of the reasons is it's long list of amenities and homes with beautiful water views. Take a look at a short aerial tour of Village Walk. For Village Walk real estate listings with no sign up, visit www.davidbarrhomes.com/village-walk-palmer-ranch. View the Venetian Golf and River Club golf clubhouse and course by air. For Venetian Golf and River Club homes for sale, please visit www.davidbarrhomes.com/venetian-golf-and-river-club. A unit in The Sansovino came up today in the MLS. There hasn't been a condo available in this building for quite some time. This is a direct beachfront condo with unobstructed Gulf of Mexico views and beachfront pool. Visit my website for more information on this unit for sale and for condo information for The Sansovino. Plantation is one of Venice's most beautiful golf courses. See more about Plantation at www.davidbarrhomes.com/plantation-venice-fl-real-estate and contact me for a tour of homes for sale. 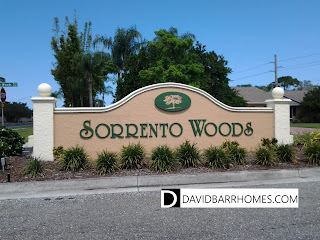 I recently showed homes to buyers in Sorrento Woods. This neighborhood offers nice amenities and beautiful curb appeal, with winding streets lined with mature oaks and palms. Sorrento Woods homes start in the mid $300,000's, with up to 3900 square feet on over-sized lots. Many of the homes are updated, with durable tile roofs and concrete block construction. About 3/4 of Sorrento Woods homes have private pools. New construction is going on all around Sorrento Woods, both residential and commercial. This residential construction growth may have affected sales in Sorrento Woods when comparing 2016 year to date sales with 2015 sales. New homes in nearby Toscana Isles, Windwood, and Villages of Milano started selling in early 2016. Out of 207 homes in Sorrento Woods, only 3 are for sale as of this writing. Lack of inventory combined with increased competition for buyers from these communities appear to be affecting resale statistics in 2016 for Sorrento Woods. Sorrento East is an established neighborhood in Nokomis that offers an excellent value for potential home buyers. Located about midway between Sarasota and Venice, Sorrento East is mostly made up of older homes with good bones. Prices here start in the mid $200,000's. Most have barrel tile roofs and are of concrete block construction. The floor plans lend themselves to renovation, with split bedrooms, open kitchen and living areas, and volume ceilings. Lot sizes give homes that have been renovated in Sorrento East an advantage over new construction, with most lots over 10,000 square feet. 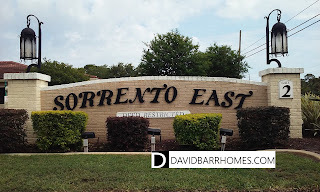 Even better, Sorrento East HOA fees are only $50 to $75 per year. 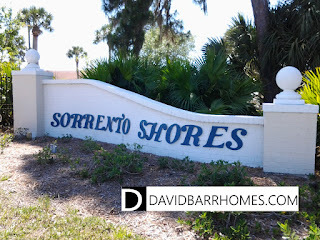 If you're a boater and are looking for a home with deep water and easy access to the Gulf of Mexico, Sorrento Shores is a good place to start. Sorrento Shores homes include multi-million dollar luxury homes with canal frontage, and more modestly priced homes without canal frontage. This area has been a favorite of both investors and new home buyers alike. Many of the original canal homes are on large lots and have been torn down or extensively renovated. We are also seeing renovation of the interior homes in Sorrento Shores. For those homeowners who are not on a canal, Sorrento Shores offers a community boat dock on a first come, first served basis. These slips can accommodate boats up to 28 feet and cost $900 annually. There is direct access to the ICW, and only one very high draw bridge at Albee Road leading boaters to the Venice Jetty and the Gulf of Mexico. 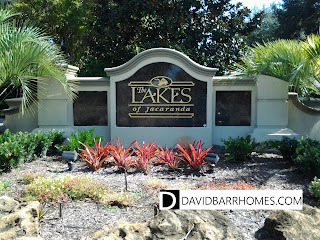 The area known locally as Lake of the Woods is made up of four separate subdivisions (Lakes of Jacaranda, Lake of the Woods, Park Estates, and Grassy Oaks), and is managed under a single homeowner's association called Lake of the Woods Jacaranda. A more in-depth explanation of the history and how the area developed can be read here. The greater area of Lake of the Woods includes 871 single family homes, centered around the 35 acre Lake Meredith. Prices start in the mid $300,000's, and range up to the mid $500,000's. Most homes are 3 bedrooms and 2 or 2.5 baths, built from the mid 1990's to 2004. Although a bit older, homes in Lake of the Woods have the attributes that today's home buyers are looking for: split plan bedrooms, volume ceilings, open concept, and durable tile roofs with concrete block construction. 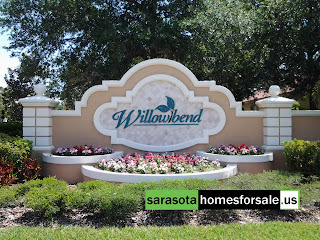 Willowbend is a newer single family home community on the south side of Sarasota, located in Osprey. Nearby attractions such as Oscar Scherer State Park and Nokomis Beach, Willowbend has a lot to like. Willowbend's 282 homes were built by Lee Wetherington Homes between 2003 and 2005, right before the market crash. Originally planned with eco-friendly Florida Friendly Yards, the landscaping evolved into the more mature, traditional landscaping we see in Willowbend today. Willowbend went through a purge of upside down homes, and most foreclosures are gone. As of this writing, there are only 4 homes available for sale in the MLS, and only 6 homes have sold here in the past 180 days, another indication of the low inventory market we are experiencing in Sarasota and Venice. The sales price during this period was $462,750, 99% of listing price after 25 days on the market. 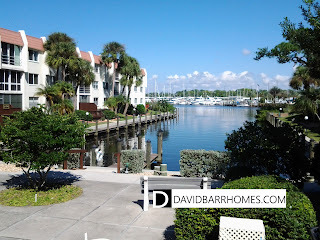 Bella Costa should be on your short list if you are looking for a waterfront Venice FL condo. Bella Costa certainly lives up it it's name "beautiful coast". The popular condo complex has 164 units, spread over seven, three story buildings, many with direct waterfront views of the Intracoastal Waterway as it opens into Roberts Bay. For boaters, Bella Costa has deeded boat docks for some of the units. For other owners, dock space may be rented from individual owners. 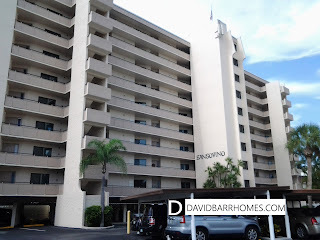 Bella Costa has elevators in all buildings, enclosed lanais, and covered carport parking, with a large community pool and clubhouse and a park-like waterfront setting. All units are 2 bedrooms and 2 baths, with 1013 to 1085 square feet of living space. Bella Costa is pet friendly, with one small cat 16-35 lbs. allowed only. Dogs must be service dogs. South Venice is a eclectic neighborhood that deserves a look if you are considering real estate in Venice FL. 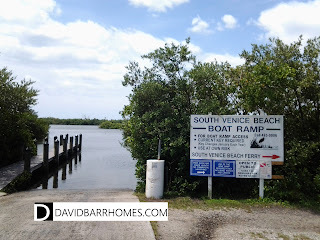 South Venice has an optional HOA, and optional access to the South Venice Ferry, which transports residents from the mainland to an unspoiled stretch of Caspersen Beach. South Venice is 100% single family homes, predominately 2 or 3 bedrooms and 1 or 2 baths. Lot sizes range from 8,000 to 12,000 square feet. Most of the homes in South Venice have private septic and well water. Home prices in South Venice are rising with the continued improvement in our local real estate market, but have not yet returned to 2006 levels. Learn more about South Venice, view current homes for sale, download a free demographic report, and get email updates for the latest South Venice real estate on my website, www.davidbarrhomes.com. 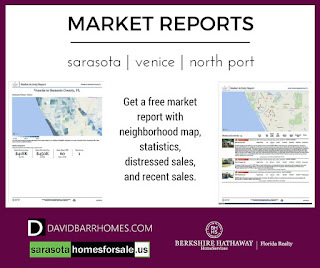 If you're thinking of selling your Sarasota or Venice real estate, take advantage of the tools I provide for you to stay abreast of the latest sales in your neighborhood. Get just sold real estate updates from the MLS by email. Click here to sign up. You can also get a more detailed market report for your neighborhood or condo which provides statistics, distressed sales, and recent sales. Click here to get your report. 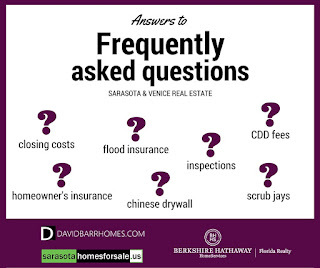 Please contact me if you have any questions or want to get your Sarasota and Venice property listed for sale today. 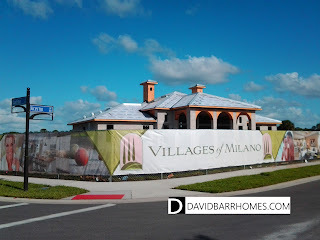 Things are moving quickly at Villages of Milano in Venice. The first picture of the clubhouse was taken at the Realtor Grand Opening back in December 2015. The second picture was taken on April 15 and shows the progress made since then. It looks like the clubhouse will be open in a couple of months. As your Venice new homes specialist, I'm staying on top of all the latest news from our new home communities. Learn more about Villages of Milano here on my website, and contact me for a tour. Venice Gardens is well-known to locals and to real estate investors. 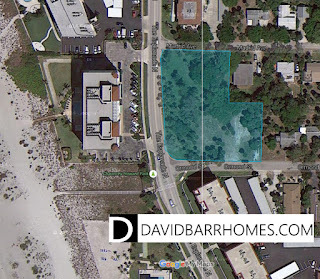 The neighborhood is centrally located just minutes to beaches and amenities. 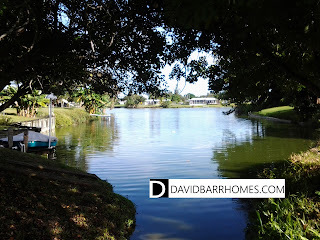 Many Venice Gardens homes have water frontage on the chain of lakes, popular with kayakers. A typical Venice Gardens home is either 2 or 3 bedrooms, with a one car attached garage and concrete block construction. Venice Gardens has an optional homeowners association, which provides access to the community pool. Venice Gardens has seen healthy appreciation in the past couple of years. Real estate investors have done particularly well since the "bones" of a Venice Gardens home have what many of today's home buyers are looking for. You can read my analysis of a Venice Gardens "flip", view Venice Gardens homes for sale on my website, and contact me for a tour. Homes in Amora do not come on the market often. In the last 4 years, only four homes have sold in the MLS. Amora was built by local builder Caithness Construction, which has an excellent reputation for quality. Homes are 1698 to 2041 square feet under air,with 2 or 3 bedrooms. A unique feature of Amora is their private courtyard or private pool. Amora does not have a community pool or clubhouse, which keeps HOA fees low at only $325 per quarter, which includes grounds maintenance. 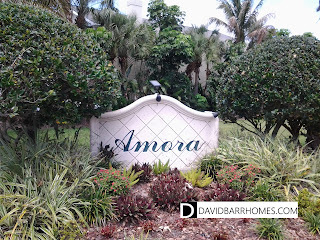 You can click here to view current homes for sale in Amora. Please contact me for a tour of available homes. 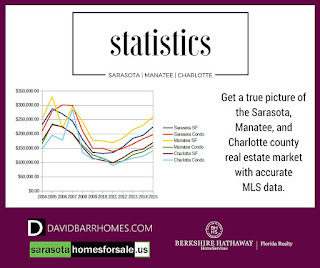 I've just updated my website with 2015 median sale price data for single family and condos in Sarasota, Manatee, and Charlotte counties. Take a look at accurate data straight from the MLS for what's happening in our local real estate market: click here to view. Remember that #AccuracyMatters. Zillow and Trulia are not the MLS and they do not have all listing data. 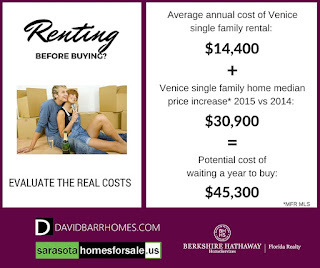 If you are thinking of selling your Sarasota or Venice real estate as prices approach 2005 levels, please contact me for a consultation. When you're searching for Sarasota or Venice real estate, you can also find the right school, all on one website. 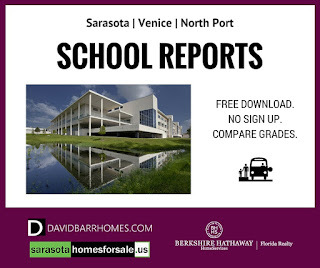 Click here to view links to school reports for Sarasota. Click here to view links to school reports for Venice and North Port. The Venice Gondola Sun has reported that a planned new 4-story condo on Venice Island has received re-zoning approval. The condo, called Che Vista Condominiums, is a project from local Venice FL developer Mike Miller. It will be the first major luxury condominium on the Island in years, since Beleza and The Waterfront were built between 2005 and 2007. According to the Gondola Sun, Che Vista is slated for development on a vacant lot on The Esplanade. A quick look at Google Maps and our local MLS reveals that parcel is likely at the intersection of Ormond St., across from Beleza on Venice Beach. Tax records indicate the parcel is owned by Venice Beach Condos LLC. If this is the correct site, Che Vista residents will have direct access to the beach through Chauncey Howard Park. Units in the south end of the building will likely have some beach and Gulf of Mexico views. Plans call for 15 units over parking on the ground floor.